Yamaha STAGEPAS 600I Powerful Full Featured Portable PA System with ultimate speaker stands , microphones and Instrument Cables:The portable PA with a full-featured mixer At the heart of the StagePas 600i is a versatile 10-channel mixer that gives you plenty of connection options for mics and instruments. You can connect up to four microphones, or switch those inputs to mono line inputs if that's what you need. And with SPX reverb on these first four channels, it's easy to get spacious, polished sounds fast. 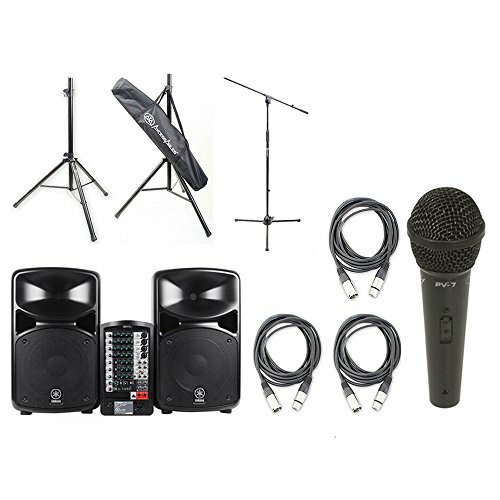 In addition, the mixer includes three stereo line ins, perfect for hooking up electronic keyboards, CD players, stereo drum machines or other devices.yamaha stagepas 600i portable pa system , yamaha stagepas 600i , yamaha stagepas 600i portable pa, ultimate speaker stands , microphones,instrument cables,yamaha stagepas 600i portable pa system package , pa systems , portable pa systems ,asin B00AL77P8W and upc 086792969343 is for Yamaha portable pa systems.This PA fights offensive feedback for you Nothing clears a crowd faster than out of control feedback. Good thing the Yamaha StagePas 600i sports onboard feedback suppression. One push of a button analyzes any feedback that's occurring and makes the appropriate changes fast, so you can get back to the music without fussing around on a graphic equalizer, or stopping the set to move microphones. Finally, a "Just Sound Better" EQ knob In addition to the three-band EQ available on each channel, the StagePas 600i boasts a one-knob master EQ. This intuitive knob makes it easy to optimize your sound for different situations, and it's perfect for schools or houses of worship where just about anyone could be controlling the system on any given day. Especially if your performance involves a mixture of speaking and various types of music, you'll love how easy it is to get a polished sound fast. Phantom Power: Connect condenser microphones and DI boxes directly to STAGEPAS.Monitor Out: Expand your front-of-house system or set up a monitoring system by using the STAGEPAS together with other powered speakers. Subwoofer Out: Add more bottom end to your system by connecting a powered subwoofer. Plugging in a subwoofer will assign a high-pass filter to the STAGEPAS speakers automatically.